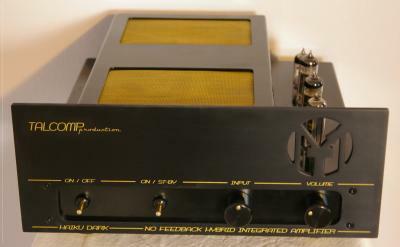 Three stage, no feedback integrated amplifier. ECC83/6N2P-EW as input stage, EL84/6P14P in single ended configuration as driver and only one pair of HEX-FET transistors per channel in the power stage wich provides 25W to 8 ohm, 45W to 4 ohm and 90W to 2 ohm load. Bias point is set on high current, so a significant part of output power (8W) is provided in pure class A. For greater powers class AB is introduced. Lack of any negative feedback ensures no TIM distortion and in combination with SE valve driver gives the less audible low-order even THD. Valve part of the circuit is point-to-point silver wired. Power supply contains EZ81 valve rectifier. Solid state part is built in dual-mono configuration with two separate power supplies.